Plot points for Mandy are discussed in this review. 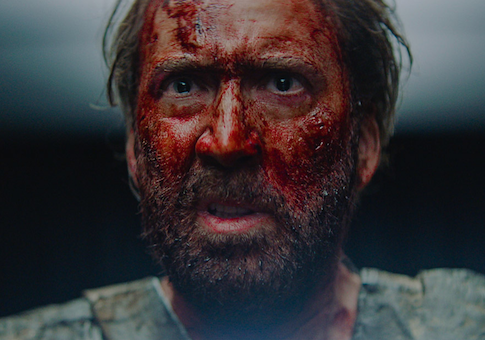 There’s a shot midway through Mandy that’s about two minutes long and acutely sums up the last 10 years of Nicolas Cage performances. Red Miller (Cage) has just awoken from a nightmare, one inspired by the violent death of his lover, Mandy Bloom (Andrea Riseborough), at the hands of Children of the New Dawn, a band of religious fanatics. Red, wearing briefs and a t-shirt with a tiger’s face on it, stumbles into his bathroom, wailing, rummaging around for what turns out to be a bottle of vodka, which he proceeds to chug and splash on his wounds—cuts on his wrist, a spear point in his side; not quite the stigmata, but close, and closer still when he receives a nail through the hand later on—and then chug again, collapsing and wailing, wide-eyed, on a toilet seat. Director Panos Cosmatos hangs back with his camera at first, keeping Cage in frame but moving very little, before pushing in on the sitting screamer. In a normal movie, this push in would reveal to us the final stages of a normal man being driven mad with grief and rage. In a late Nic Cage movie, it is the scene where he reverts to form: the previous hour, during which Red was pretty laid back and calm and happy, was a charade. We, the audience aware, knew it was a mask, a fraud. This maniac before us now—this man who will, in short order, retrieve a crossbow he has stashed with a friend for some reason and forge an axe out of what appears to be chrome (or possibly silver or maybe stainless steel, I couldn’t quite tell, it doesn’t really matter) so he can do battle with a trio of bikers who look like refugees from the Hellraiser series as well as the aforementioned cult that killed his woman—is the real deal. Mandy is, basically, a heavy metal nightmare, a series of roughly connected images—hallucinations washed out with a red tint when they aren’t streaked in bright, blinking greens and whites—that unfold in a sort of dream logic. The story is simple enough (man seeks revenge for the death of a loved one) yet told in an impressionistic sort of way that lends itself to multiple readings. Perhaps it’s simply the tale of a recovering addict driven to madness by a cult’s predations. I like to think it’s the legend of a demigod living with his mortal love in the upper northwest, bemused by mankind’s creations like the mac-and-cheese hawking Cheddar Goblin and generally happy, a great warrior hiding from his responsibilities and bloodline until he is forced to retrieve his mystical weaponry (the aforementioned crossbow, kept safe by the always-great Bill Duke) in order to slake his reawakened bloodlust. The film’s score, which opens with a track by Crimson King and was composed by Johann Johannsson, contributes to this atmosphere by creating a sense of foreboding throughout the film’s first half. A synth line pulses beneath the action throughout, spiking and jarring when we are introduced to new evils, mellowing when Mandy and Red are more relaxed. I would’ve liked to have seen the film on a big screen, but there’s something to be said for watching it at home, in the dark, on your laptop, with a good set of headphones strapped on, luxuriating in the rich aural landscape that Johannsson and his collaborators have painted. Title cards with curlicued-fonts call to mind paneled vans from the 1970s filled with fans of Led Zeppelin or Yes or Black Sabbath; brief animated interludes conjure up hazy memories of Heavy Metal. This is a rock opera as envisioned by the lords of hell. Mandy is an instant cult classic, the sort of movie that has no real place in mainstream multiplexes but will play for decades on the midnight movie circuit, will serve as a passkey for a certain variety of film fan in college dorm rooms. Get in on the ground floor. The post ‘Mandy’ Review appeared first on Washington Free Beacon.